Successfully Added iMacwear Unik2 Bluetooth Smart Watch - Sapphire Glass Screen, 5 ATM Waterproof, Anti-Sweat + Anti-Crack Silicone Strap (Black) to your Shopping Cart. The iMacwear Unink2 is your ultimate sports watch. With a tough sapphire glass display and waterproof rating this classic smart watch is packed full of great features and looks absolutely stunning. 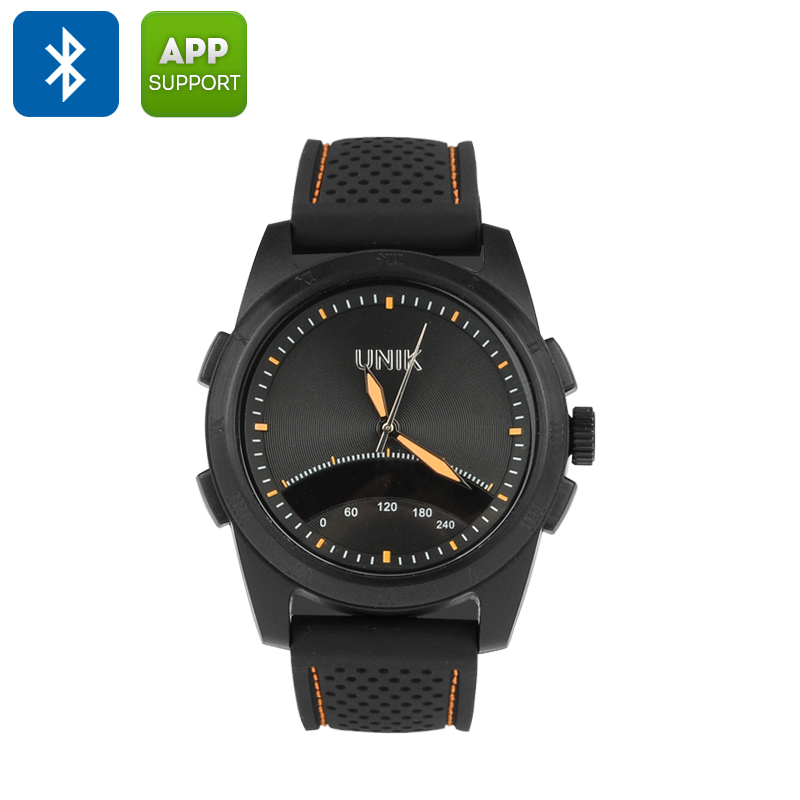 The Unik2 Bluetooth Sports watch has been crafted to look survivor the punishing activities of a professional sportsman yet retain the sophistication and elegance you would expect from a traditional timepiece while also bringing a wealth of functions to aid everyone. The smart watch has a 5 ATM waterproof rating so it is perfectly at home in the water as well as on dry land. This is one watch that you don't have to worry about getting wet so you can take it diving, swimming sailing without fear. It’s held on your wrist by a tough, high-density silicon wristband that is resistant to breaks and won’t end up getting smelly after those sweaty workouts. The display is covered by a sapphire glass which makes it resistant to scratches and many other forms of damage so no matter how active you are this watch will remain with you and keep working through it all. Compatible with most Android and iOS devices the iMacwear Unik2 uses Bluetooth 4.0 to truly come to life. With sedentary reminder, pedometer and sleep monitoring there are plenty of health benefits to this smart time piece. It will keep count of the steps you take and let you know when it’s time to sleep or pick it up a gear and get some exercise done. When you get incoming calls and messages the watch will gently remind you with a little icon appearing on the screen and a discreet alert. So you can keep aware of any incoming calls and messages without letting them interrupt or distract you thought the day. With a Citizen WICCA movement you get precision chorography and the built in 320mAh battery provides power to all the smart sensors and Bluetooth functionality for up to 30 days in standby so unlike most of the watches out there the Unik2 can keep pace with the every user. The iMacwear Unik2 Smart watch comes with 12 months warranty. Brought to you by the leader in electronic devices as well as wholesale smart watches, Chinavasion..
APP Support for devices running Android 4.3 and IOS7.0 above.